Add a rule to assign a skill to the performer based on their responses to control tasks and ban the performers who give incorrect responses. How many of the performer's recent responses in the project's control tasks are used for the calculation. If the field is empty, the calculation is based on all performer's responses in the project. Answer count — The number of completed training and control tasks. correct_answers — The percentage of correct responses in training and control tasks (from 0 to 100). %incorrect answers — The percentage of incorrect responses in training and control tasks (from 0 to 100). golden answers count — The number of completed control tasks. 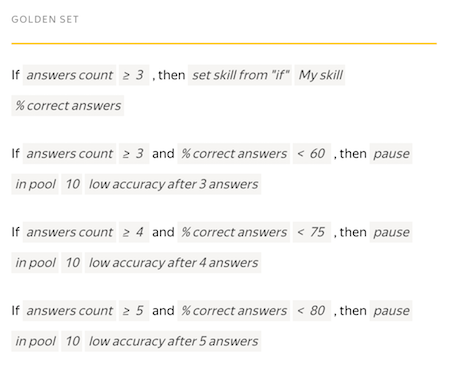 % correct golden answers — The percentage of correct responses in control tasks (from 0 to 100). % incorrect golden answers — The percentage of incorrect responses in control tasks (from 0 to 100). set skill from "If" — Save the performer's percentage of correct responses as the skill value. If the performer gives at least 3 responses to the control tasks, the percentage of correct answers is written as the skill value. If the performer gives at least 3 answers to the control tasks and the percentage of correct answers is less than 60%, they are blocked in the project. The calculation uses up to 10 performer's responses to the project's control tasks. The performer is banned after the first incorrect response to the first, second or third control task. However, the skill isn't set. Since the ban reason is not specified, it is impossible to find out why the performer is banned. If the performer gives at least 3 responses to the control and training tasks, the percentage of correct answers is written as the skill value. If the performer gives 2 incorrect answers to 3 control tasks, they are blocked in the pool for 10 days. If the performer gives 2 incorrect responses to 4 control tasks, they are blocked in the pool for 10 days. If the performer gives 5 or more responses to the control tasks and the percentage of correct responses is less than 80%, they are blocked in the pool for 10 days. Such set of rules prevents performers from being blocked for one incorrect response and lets you maintain high accuracy. If the performer completes 3 control or training tasks, they get a skill. Use the skill value to set access to other pools with filters. This rule will never take effect because the number of responses counted (History size) is less than the number of responses in the rule (answer count). If the percentage of correct responses in the control tasks is less than 40%, the performer is blocked on the project for 30 days. This rule doesn't take into account responses in the training tasks for blocking. If the percentage of correct responses in the control tasks is less than 40%, the performer is blocked on the project for 30 days. The rule will work once — after the fifth response in the control task.